This is a really nice set of six Crystal with Blue Drizzle 5 inch high Water Tumblers made by Hazel Atlas. All six Tumblers are in excellent condition with no chips, cracks, scratches or cloudiness. 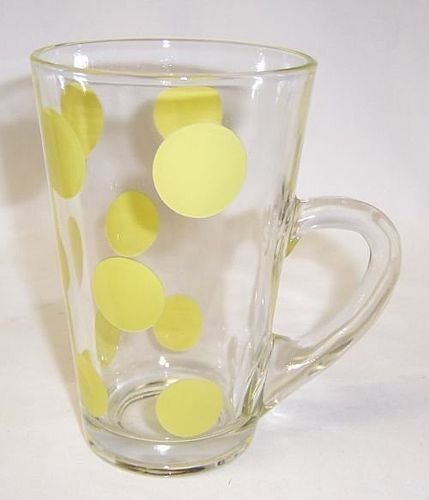 Be sure to search our other kitchen glass available. We guarantee all items to be as described. Feel free to email with any questions. THANK YOU. This pretty iridized Fish Scale Demitasse Cup and Saucer was made by Anchor Hocking from 1941 to 1965. This Demitasse cup measures 2 1/2 inches in diameter X 1 3/4 inches high. The Demitasse Saucer measures 4 1/4 inches in diameter. 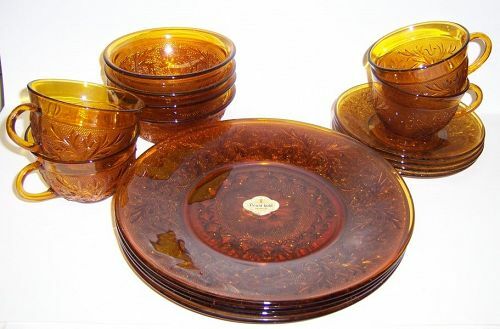 They are signed ANCHOR HOCKING - OVEN PROOF - MADE IN U.S.A. Both the Cup and Saucer are in very good condition with no chips or cracks. This is a really nice 14-Piece Sandwich Punch Bowl Set made by Anchor Hocking. This Set includes the Punch Bowl which measures 10 inches in diameter X 5 inches high, twelve cups and a clear plastic ladle. The Bowl and Cups are cremax in color with gold trim. 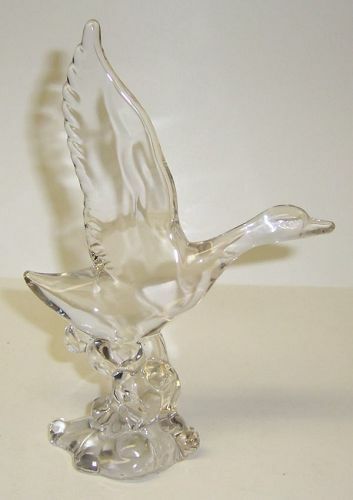 All fourteen pieces are in excellent condition with no chips or cracks. The gold is all very good. The plastic ladle is good. 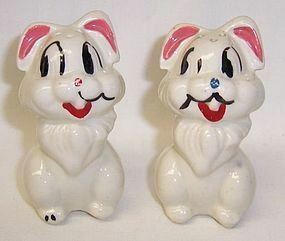 Be sure to search our other kitchen items available. We guarantee all items to be as described. THANK YOU. This pretty crystal clear Manhattan depression glass 10 ounce Beaded Foot Tumbler was made by Hocking Glass from 1939 to 1941. This Tumbler measures 5 1/8 Inches high and is in very good condition with no chips or cracks. We guarantee all items to be as described. Feel free to email any questions. THANK YOU. 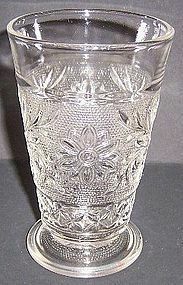 This pretty crystal clear Sandwich depression glass 3 5/8 inches high X 2 inches in diameter thin Juice Tumbler was made by Hocking Glass from 1939 to 1964. This Tumbler is the harder one to find. It is in very good condition with no chips or cracks. Be sure to search our other Sandwich available. We guarantee items to be as described. Feel free to email any questions. THANK YOU. 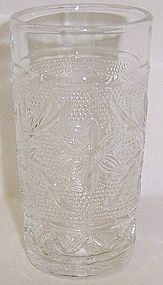 This pretty crystal clear 5 Inch 9 Ounce Footed Water Tumbler was made by Anchor Hocking from the 1940s to the 1960s. This Tumbler is in very good condition with no chips or cracks. Be sure to search our other Sandwich available. We guarantee all items to be as described. Feel free to email with any questions. THANK YOU. 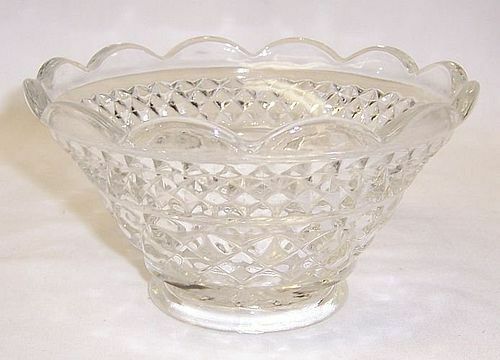 This pretty crystal clear Sandwich depression glass 5 inch Ruffled Berry or Fruit Bowl was made by Hocking Glass from 1939 to 1964. This Bowl is in very good condition with no chips or cracks. Be sure to search our other Sandwich available. We guarantee all items to be as described. Feel free to email any questions. THANK YOU. 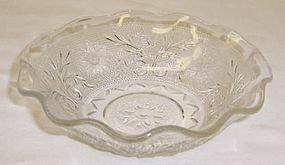 This pretty crystal Stars and Stripes depression glass 8 Inch Salad Plate was made by Anchor Hocking Glass in 1942. This Plate is in very good condition with no chips, cracks or scratches. The colored streak on the plate is from the flash. We guarantee all items to be as described. Feel free to email with any questions. THANK YOU.